Many cities have primarily residential or other low-intensity streets where sidewalks and green infrastructure are either substandard or non-existent. 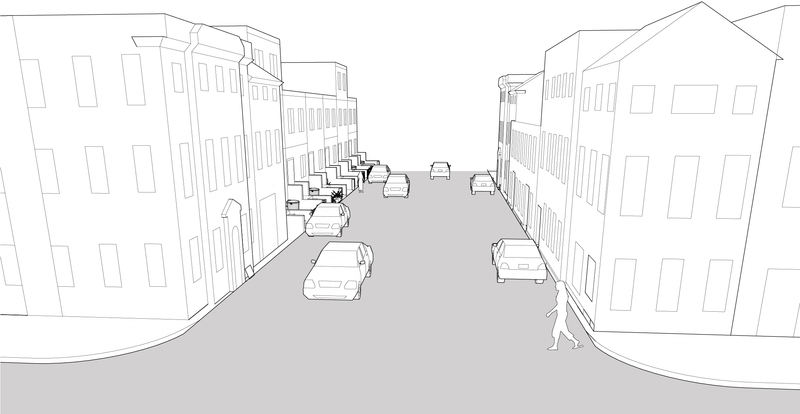 These streets operate as de facto shared spaces, with people driving, bicycling, and walking in the roadway. Flooding and crumbling street surfaces are common. These streets can often be redesigned as shared spaces, with a dramatically improved environment for walking, bicycling, and playing while accommodating service, delivery, and very local motor vehicle access. Streets that are to operate as shared streets must be designed explicitly to promote safe, extremely low vehicle speeds. The roadbed accommodates low-volume local traffic. Parking occurs informally along the street and there may be unimproved drainage trenches. Pedestrians use the entire road space for walking but are not provided any formal walking space or protection from through traffic. If any operational friction occurs (such as two vehicles passing, or a moving vehicle passing a parked vehicle), pedestrians are consigned to the edge of the street, in very uncomfortable walking conditions. During large storm events, runoff may flood in the informal drainage trenches, gathering debris and pollutants and potentially pooling on the roadway. Textured or permeable pavements that are flush with the curb reinforce the pedestrian-priority nature of the street. Special pavements, especially permeable interlocking concrete pavers, may be subject to additional maintenance costs and should be selected based on regional climate and long-term durability. Material selection should consider compatibility with winter maintenance like plowing where applicable. If permeable pavements are used in the corridor, site facilities to minimize the amount of run-on from impervious areas. 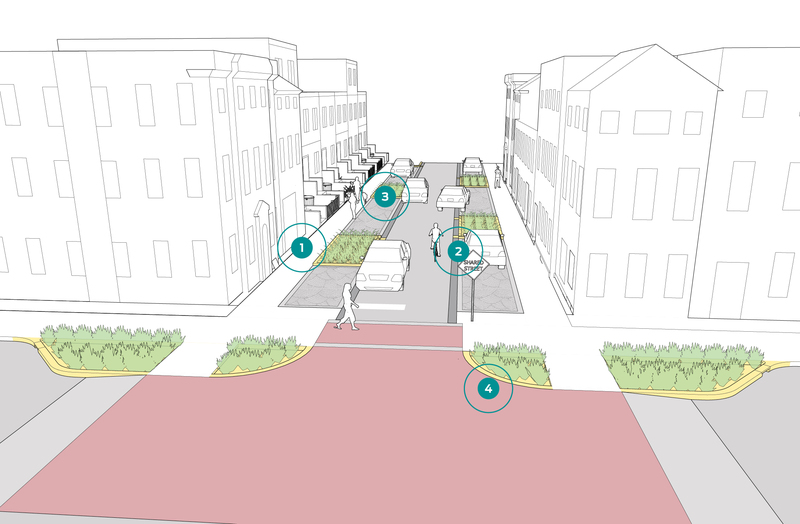 In the illustrated example, trench drains collect runoff and direct into Bioretention Planters, while also providing a detectable alert between the shared roadbed and parking/pedestrian access lane. Shallow gutter pans may also be appropriate for directing runoff, depending on volume. 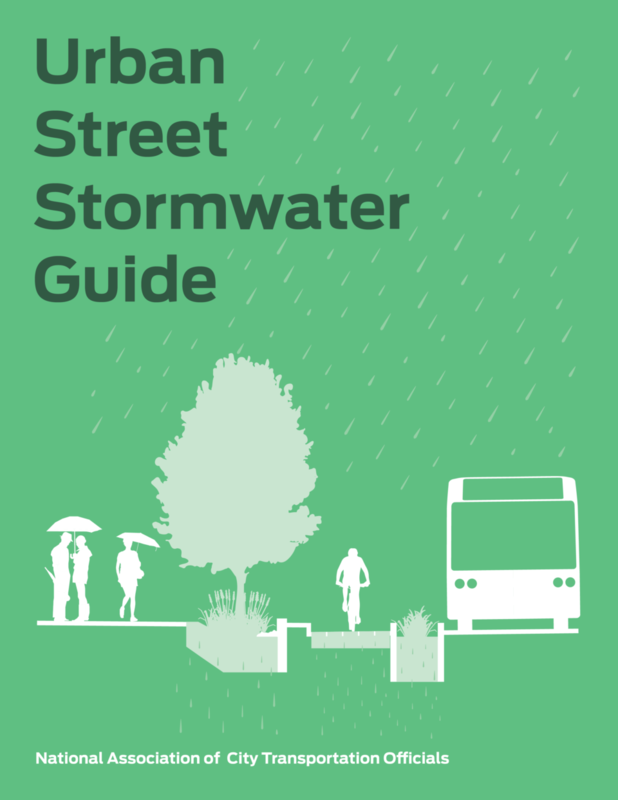 Grade the street to provide accessible, level walking surface while directing stormwater flow to green or gray stormwater infrastructure. The cross slope must be at least 1% to drain runoff, but cannot exceed 2% to provide an accessible pedestrian surface. If permeable pavement is used across the full roadway, design the street grade and cross slope to channel water that does not infiltrate down the street to an approved discharge point. Low fencing or slotted curbs may be sited around the entire edge of bioretention facilities to prevent incursion by pedestrians or vehicles. Bioretention facilities with vertical walls should be shallow in tighter geometries to reduce tripping and injury risk and allow for ease of maintenance. Gateway treatments that slow or restrict traffic flow are critical to enforcing low-speed motor vehicle operation and provide safe and comfortable walking and bicycling conditions. Pinchpoints, speed humps, and raised crosswalks or speed tables are effective at enforcing motor vehicle speed, but must be designed to align with water flow patterns. Street furniture, including bollards, benches, planters, and bicycle parking, can help define a shared space, subtly delineating the traveled way from the pedestrian-only space. Bioretention can integrate seating or artistic elements to further define edging, protect stormwater facilities from incursion, and enhance the sense of place. Bioretention facilities may need to be lined, especially when in close proximities to basements and structures. Implementation may require either relocating or installing a sleeve around service utilities near bioretention facilities. In some cases, parking may be permitted directly adjacent to properties in a residential environment. Ensure that pedestrians are provided clear accessible paths along the entire surface of the street and to destinations at all times of the day.